Christie, a leader in creating and sharing the world's best visual and audio experiences, has teamed up with AVI-SPL, the world’s leader in AV systems integration, to enhance Invenergy’s control center with 10 Christie FHD552-X HD 55-inch flat panels and five Christie Phoenix systems. Invenergy develops, owns and operates power generation and energy storage facilities in the Americas and Europe, including 65 wind farms as well as 19 solar, battery and natural gas projects in North America. 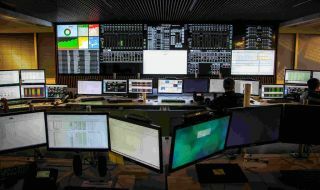 Its remote operations center, the Invenergy Control Center, monitors, maintains and schedules power for Invenergy’s fleet of generation facilities. The Invenergy Control Center was initially located in the operations building at a wind project in Texas, far from the head office, and only operated when technicians were off site. Hampered by power and Internet connectivity issues, Invenergy made the decision to bring the control room to Illinois. Along with the move to Chicago came the decision to replace their existing outdated video wall with a new system. With AVI-SPL, the world’s top AV systems integrator, providing the design and installation of the video wall, Invenergy selected 10 Christie FHD552-X HD 55-inch flat panels, in a five by two configuration, and five Christie Phoenix systems to power the wall. Purtell says the selection of the Phoenix system was a given. Invenergy is still considering the many ways to use the video wall, including displaying data from sites in Poland and Scotland via the wall in Chicago.